An extremely rare large-scale chandelier by Paavo Tynell. 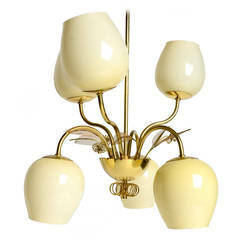 The chandelier features a brass floral detail at the top, cascading brass detail along the stem with a perforated brass shade, raised gallery edge, and a fluted brass detail on bottom center. Manufactured by Taito, OY, Finland, circa 1950s. 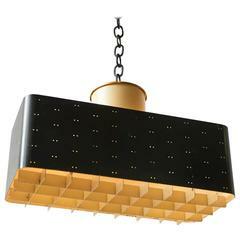 A round flush mounted ceiling fixture in white enameled steel with brass diffuser and a perforated outer edge on frame. The cap at ceiling is stamped Taito. Finland, circa 1950s. 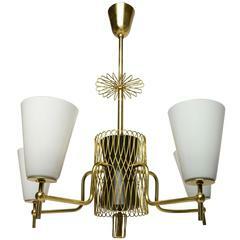 A solid brass four-arm chandelier by Paavo Tynell for Taito Oy, Finland. Model 9029/4. Existing wiring, rewiring available upon request. 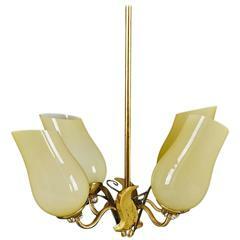 A very nice and large Paavo Tynell chandelier. Trademark leaves and brass roundettes surround the scalloped bras centre. 2 available. A rare and elegant chandelier by Paavo Tynell for Taito Oy, Finland, circa 1950s. 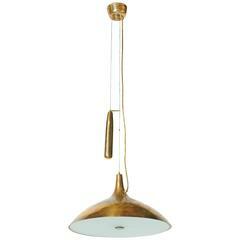 Brass, patinated, glass reflectors and stitched fiberglass shades.